Elizabeth Ghaffari is President and CEO of Technology Place Inc. a California corporation founded in 1989 to deliver strategic technology advisory services to U.S. and international business clients. Previously, she was a manager of IT at major financial institutions in California and a consulting economist to major development firms here and abroad. Ms. Ghaffari also runs Champion Boards, established to foster the design of great boards of directors through knowledge and information, with a special emphasis on the advancement of top-level women to corporate board roles. Since 2009, she’s been a director of Pacific Coast Regional-SBDC, certified by the US Treasury as a Community Development Financial Institution. Ms. Ghaffari received her MS, Management from the University of California, Los Angeles (Anderson School of Management) and her BS, Political Science from The American University, Washington, DC. 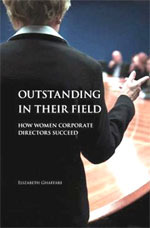 Ms. Ghaffari is the author of Outstanding in their Field: How Women Corporate Directors Succeed (Praeger: 2009), consisting of interviews with 15 women directors and analyses of the 114 women on the boards of California Fortune 1000 firms.